Ink and Lace with Sheryl Cauble: Grace Summertime "Sending Sunshine"
Hello! 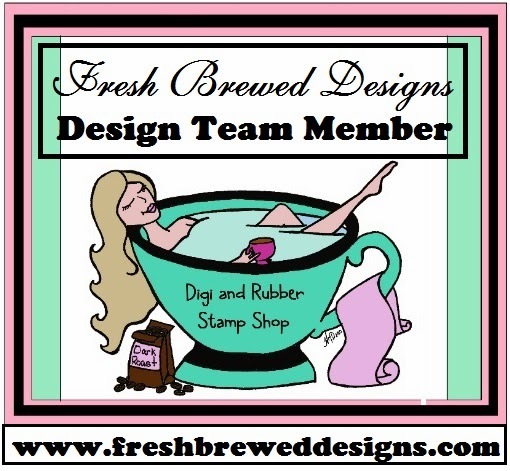 What a nice surprise to wake up this morning and find that I won two new adorable digi stamps from Fresh Brewed Shop Designs! I had participated in their fun Blog Hop for their new digi stamp release! Coincidentally, I just finished making two new cards with one of their adorable digi stamps! I made this bright and cheerful summer card with a precious digital stamp called, "Grace Summertime" from Fresh Brewed Shop Designs! They have a challenge at Freshly Brewed Challenges for a card with "Lots Of Yellow" right now. I did my best to mostly use the color yellow. I couldn't resist using a yellow orange color along with the yellow though to help little Grace pop! I used Stampin Up designer paper and cardstock. I punched the pail and shovel beach trim with my EK Success punch. I also used my Martha Stewart 2 Dot Scallop punch. I punched the butterflies out with my SU Beautiful Wings Embosslit Die. The flower is punched out with MFT dienamic. The scallop lace, Bling and yellow flowers are from my stash. Sorry that my picture is crooked! I had the worst time trying to get a good picture. It's a rainy gloomy day here! Freshly Brewed Challenges Lots of Yellow! If The Shoe Fits Scrap It "Pearls"
Oh this is just BEAUTIFUL!!! I LOve the lace and the sandcastle punch. The pearls and bling add that perfect touch of shimmer. Thank you for playing along with us at Freshly Brewed Challenges!!! Lovely summer card! I adore that image and the shades of yellow you used! Thanks for playing along with us at the Shoe!